yanaginagi - here and there [Osu|CatchTheBeat] · forums · community | osu! 00:15:300 (5) - you should NC this as well then because you NC every new pattern of sound, and 5-6-7 come from different sound. 00:21:256 (3,4,5) - this looks weird, I think doing it like 00:35:374 (3,4,5) - is better. maybe you can copy paste it or curve those sliders. 00:22:139 (6,7,8,9) - this pattern combines both vocal and the instrument together which makes it sound like it's not following the music. 00:27:764 - shouldn't the triplet be here not at 00:27:212 (3,4,5) - ? 01:13:315 (5,6) - (5) is given such a poor spacing emphasis while (6) is given huge spacing. When it is clear that (5) should be the emphasized one. I know, I know, it's hexgrid mapping and some things have to be sacrificed. In this case, it's the spacing emphasis to keep the visual and aesthetic. If you could find a workaround to give (5) a better spacing emphasis, that would be great. 00:15:300 (5) - same thing about the insane, NC. but it may not be necessary here though. 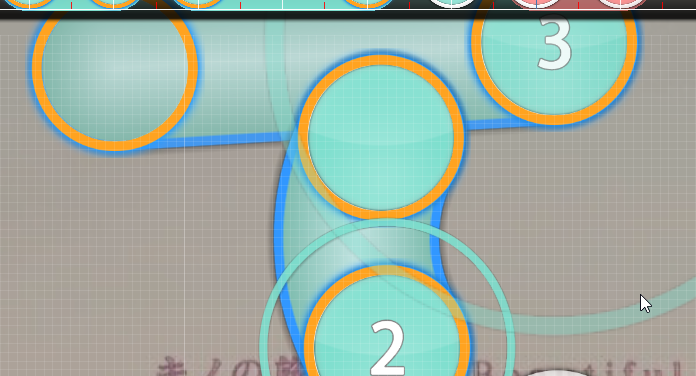 I recommend that you make 00:54:786 (1,2) - 2 1/2 sliders instead and you should also raise the SV to 1x if u want. 00:56:330 (1,1,2) - you're relying on the approach circle here for reading. (which isn't good) 00:56:330 (1,1) - is 1/1 but 00:56:772 (1,2) - is 1/2 when the 1/2 gap has even bigger spacing than 1/1. I would suggest you to simply stack 00:56:772 (1) - under 00:56:330 (1) - . which will differentiate and tell the player that the gap is 1/1 while you can still retain the 1/2 jump. 01:26:550 (8) - NC for final object? is this diff even needed lmao, Normal is already pretty ez. 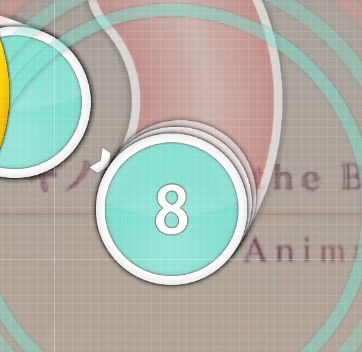 The mapset looks clean, should be easy for ranking. 00:18:389 (3,4) - Add dash between this. I suggest move to x:80 and maybe change slider to diagonal. 00:26:992 (2,3,4,5,6,7) - I think distance between this should be more a bit. I suggest move (3,5) to x:356 and (4,7) to x:404. 00:49:050 (8,1,2,3) - I think it should have a movement. I suggest move (1) to x:328 and (2) to x:296. Thank you for mods and stars! 00:10:227 - why it's Hdash? I think if you added in a few more gaps like I suggested above it would be pretty nice. It would give a much better spread. 01:14:639 (3) - slider looks a bit weird and uneven. Can you neaten it up a bit? I can bubble the std diffs if you get rid of the drum snare hitsounds on the slider ticks in the Easy diff. 00:12:433 (1,2,3,4) - 00:12:874 (2,4) - Hdash move to 00:12:653 - and 00:13:315 - idk why. I checked the Ranking Criteria. Slider tick hitsounds should be fine. Fixed all except two things. Thanks a lot! 00:06:256 (3,4) - It would look neater if you overlapped more OR got rid of the overlap. Objects that touch a tiny bit can look a bit untidy sometimes. 00:08:021 (4) - In here, you used the only 1/2 pattern in this music part, but this part doesn't need to be emphasized like this. Just replace it two circles, it could be better for expression. 00:38:903 (3,4) - 00:42:433 (3) - this two of music part looks similar, but why your rhythm selection is different? I think you should set same rhythm for consistency. 00:44:197 - ~00:51:256 - As you know, this part has the lowest intense in music. but you made 1/2 rhythms only for emphasize. i don't think this is good, for better intense, I suggest you making 2/3 repeat liders in 00:44:197 (1,2) - . 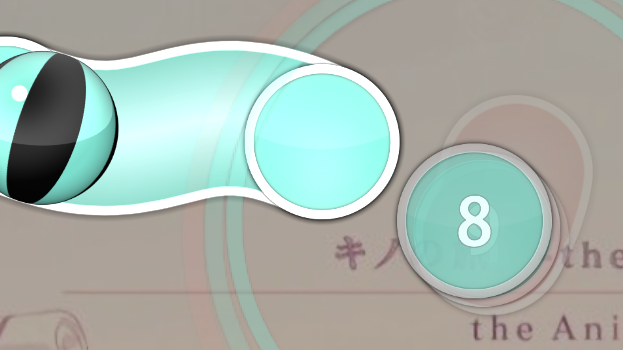 01:09:786 (2,3) - just my thinking, this overlapping slider is good for visual, but thinking about playing for newbies, I think this pattern looks little bit hard to play. you can make it like this for better readng, just my suggestion. 01:19:492 (1,2,3) - 01:23:021 (1,2,3) - could you set it as wide-angle? newbies can be confused for reading this, because 01:19:492 (1,3) - is located too near, newbie can read 01:19:492 (1,3) - as 1/1. 00:20:374 (2,3,4,5) - for seeing this, you followed background drum sound, but for seeing 00:16:844 (2,3,4,5) - , you followed vocal. for consistency, you should follow only one thing. 00:30:080 (1,2,3,4,5,1,2,3,4,5) - has same problem. 00:40:447 - you should delete this beat, for seeing other rhythms ,you didn't add this rhythm. 00:41:550 (3,4,5) - for better visual of pattern, I suggest you triangle pattern. 01:01:624 (8,9,1) - In STD playing, stack system makes messy pattern in here, 01:00:962 (7,8) - DS looks too near in-game playing.like this. you should increase Ds in here, or try this. 00:20:153 (2,3,4,5,1) - You can make better pentagon pattern for visual of pattern. 00:41:440 (2,3,4,5) - weird rhythm, I think 00:41:440 (2) - doesn't have sound, and playing looks difficult imo. you should delete 00:41:440 (2) - . Hello, just here to take a quick look at the rain before whoever is checking comes. 00:03:389 (1) - Really strange to have such a strong sound as a sliderend here, considering it was a dash at least in most other cases of that sound. 00:07:139 (1) - This piano note is stronger than the earlier ones, yet you have a normal dash to this one, whereas a HDash to the other ones. Try a HDash to this to follow the music better. 00:08:021 (1) - Very weak sound here, having a HDash to it sounds really weird musically, at least reduce it to a dash if nothing else. 00:10:447 (1) - Similar case to 00:03:389 (1) - , but also having a HDash to this makes no sense as it's quite inconsistent with previous section, and the sound isn't strong really. 00:13:094 (3) - Would maybe be better to have a normal dash to this, it would match the buildup nicer to have a dash to the first one, and then a HDash to the second. 00:14:197 (1) - Having a HDash to this really doesn't fit your current rhythm structure at all, for the rest of these triplets, you've done a normal movement to the third part, and this one isn't stronger in any way, so using a HDash sounds very strange. 00:14:418 (2) - On the other hand, this one is a stronger version of the other triples you've been using, however there is no notable movement to this, which sounds super awkward with the music. 00:14:859 (4) - No strong sound on this at all, not really hearing any reason for the HDash if I'm honest. 00:15:962 (1,2,3) - Really strong HDash to this, would really highly recommend reducing the HDash strength a little by moving this section to x:108. 00:21:256 (1,2) - Feels really weird to play this due to the strong sound being on the 3/4 which is currently a slider end, whereas the HDash is just to a weak vocal instead. Would restructure this part a little bit. 00:23:021 (1) - Pretty strong HDash to this considering the direction change, try x:140 instead. 00:23:903 (3) - Not really strong enough of a sound to imply a HDash, quite weak overall, would recommend just reducing it to a normal dash. 00:26:550 (1) - Feels kinda forced against the wall right now due to the HDash strength, would probably be best to keep to the guideline and go with x:496. 00:28:315 (1) - This sound really isn't stronger than the other sounds at all, would maybe understand a dash to it for the downbeat, but doing a HDash sounds really bad with the music here. 00:29:639 (4) - Small change to make the dash slightly more managable after the HDash would feel good, maybe try x:236. 00:32:506 (3) - This vocal is slightly stronger than the surrounding ones, but just doing a normal dash to it would be a lot more fitting, as it doesn't particularly stand out as a strong note. 00:35:374 (1,2) - Similar situation to 00:21:256 (1,2) - . 00:38:021 (3) - Really not a strong enough note to imply a HDash here, normal dash would be much more fitting with the music here. 00:39:565 (2,3) - Would actually be a lot nicer to have the HDash to 2, as that's a strong piano note, and then just have a normal dash to 3, as that note doesn't really have any outstanding sounds. 00:41:440 (3) - Hmm, not really hearing any strong sound on this sound at all, much less any reason to have a HDash to it. Try just doing a normal movement in it. 00:43:315 (2) - Again not really any sort of strong sound here to indicate using a HDash, would recommend a normal movement on there. 00:43:756 (6) - HDash to that one would be a lot more fitting. 00:44:197 (1,2,3,4,5,6,7) - Very strong HDash to this is really strange to play considering the speed in it, could really throw a rain player off. Try reducing it by moving this section to x:320. 00:45:521 (8) - Considering the vocal here and the piano on the next note, would be nice to have a dash both to and from it. Maybe try x:396. 00:46:624 (4,5,6,7,8) - Pretty strong vocal on this one, try x:304 on here to add a dash to it. 00:49:050 (8) - Dashing here for this vocals would feel pretty good to play, try x:160 on that one. 00:52:139 (3) - This slider sounds really weird to play because it's a 3/4 slider surrounded by 1/2, with no clear vocal on the 3/4 whereas the rest of the 1/2 sliders have had very clear vocals on ends. 00:54:786 (1,2) - Would be better to weaken this HDash a little bit considering it's a direction change right after. Try x:88. 00:56:771 (2) - Considering the strength of the sound on the sliderend here, would be a lot nicer to have at least a dash to the sliderend, if not reducing 00:56:330 (1) - to 1/2 and doing a double HDash. 01:00:962 (4) - I think this would be nicer as a 1/2 slider considering there is a clear drum on it. 01:03:168 (5) - Not really a strong enough sound to imply a HDash on it, try a normal dash for consistency with the rest of this kiai time so far. 01:04:050 (3) - Might as well make this one a normal dash too, feels really weird to have a HDash to this drum considering you had dashes for most of the previous part, just try a dash to this one too. 01:04:933 (5) - The strength of the vocal on this sliderend feels highly ignored right now. I would highly recommend at least adding a dash if not a HDash to it. 01:08:021 (4) - Similar to 01:00:962 (4) - . 01:10:227 (5) - Split it into 2 circles with a higher distancing, would feel nicer with the vocal strength of the sliderend currently. 01:11:771 (8) - Current HDash pattern feels kinda difficult for a rain, and also I can't really hear the reason behind having a HDash to this. Try reducing this one to a normal dash by making it at x:228. 01:15:521 (6) - Again, would be better to have a normal dash to it for consistency with the previous sections. Don't give up, the difficulty is really good, I don't think the text wall was warranted at all <: If you need a mod, let me know! you guys know that whether you agree with the stuff i posted or not is irrelevant right? i posted my reasons, and the mapper can decide based on my reasoning whether he wants to accept or not. stop trying to think for the mapper, he's able to do it himself since he's proved he's a capable ctb mapper. also implying that the length of my mod implies i dislike the map is stupid, firstly my mod wasn't that long, secondly, i do like the map, i just feel like these adjustments will help the map's quality a lot better with how the music goes, as currently, i feel as though the points i made direct to issues with how the map follows the song currently. please don't leave highly offensive comments both to me and the mapper's intelligence by implying he can't think for himself. Implying that a 7 point mod would really be suitable even for an amazing map is quite ridiculous, and it's quite clearly an insult to someone's intelligence when you feel as if you need to tell the mapper the quality of a mod, rather than letting him reply and determine that for himself. Either way, shitposting the thread does nothing, wait for the mapper's response instead, since it's his choice what he does with his map, not yours. At the end of the day, you could do a full response my mod disagreeing with every point, yet it's still the mapper's choice on what he agrees/disagrees with.